Style Source Magazine | Rusk Thermal Serum 4.2 oz. Home /	Brands / Rusk Designer Collection / Rusk Thermal Serum 4.2 oz. 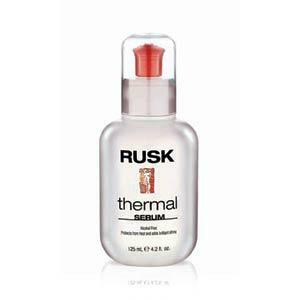 Rusk Thermal Serum 4.2 oz. This smoothing serum protects the hair from heat and adds brilliant shine. Dryness and frizz are eliminated creating a healthy look. Sunscreens protect the hair from environmental stress. Contains Thermplex that provides thermal protection from heat stress caused by daily use of styling appliances. Rusk Thermal Shine Spray 4.4 oz. Rusk Thermal Flat Iron Spray 8.8 oz.